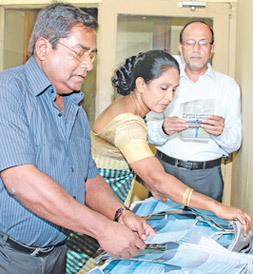 Picking the readers winning coupons at the end of count number 14 in the Observer-Mobitel Most Popular Schoolboy Cricketer of the Year. From Left: Rodney Martinesz (Senior Associate Editor, Daily News), Ms. B.P. Pushpika (Chief Administrative Officer, ANCL) and M.O. Jayah (DGM, Pre-Press and Administration). Picture by Thilak Perera. A close tussle is on, in all three segments, Platinum, Gold and Silver in the Sunday Observer/Mobitel Most Popular Schoolboy Cricketer of the Year Contest this year. 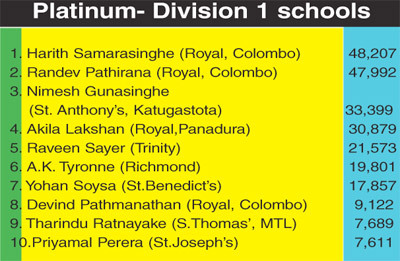 Harith Samarasinghe (48,207) of Royal College, Colombo managed to maintain his lead with a majority of 215 votes over his closest rival and teammate Randev Pathirana (47,992) in the ‘Platinum’ Contest for division one schools at the end of count number 14. 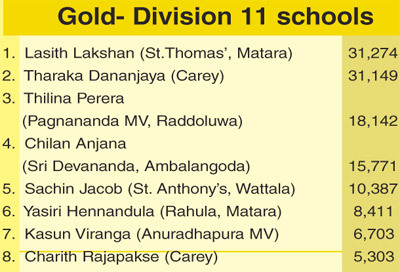 In the ‘Gold’ segment the lead was even slender when Tharaka Dananjaya (31,149) of Carey College was pushed down to number two by St. Thomas’, Matara’s Lasith Lakshan who polled in (31,274) to obtain a 125 majority and take the top spot. 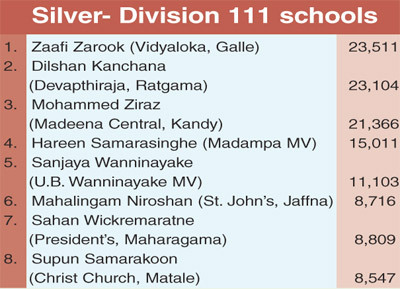 In the ‘Silver’ segment for division III schools Zaafi Zarook of Vidyaloka, Galle was still at the top with a vote count of 23,511 votes to Devapathiraja MV’s Dilshan Kanchana (23,104) with a lead of 407 votes.